Still full from the night before, our day started with an over indulgent breakfast in the orangery of the Prawles Court B&B where we were staying. It was totally unnecessary, but did set us up for the day and we barely ate again before dinner in the evening. I'd put quite a bit of effort into planning the weekend selecting accommodation, activities and dinners that I thought we'd enjoy, all for one purpose; I was going to propose to Becks during the weekend. I didn't know when or how, I was just hoping that an opportunity would present itself during the weekend. I slipped the jewellery box into my bag as we left the B&B for our day at Sissinghurst Castle. When we arrived I was hoping to slip the jewellery box out of my bag and into my pocket but Becks didn't turn her back for a moment, so I had to let the opportunity pass and we headed off towards the entrance. 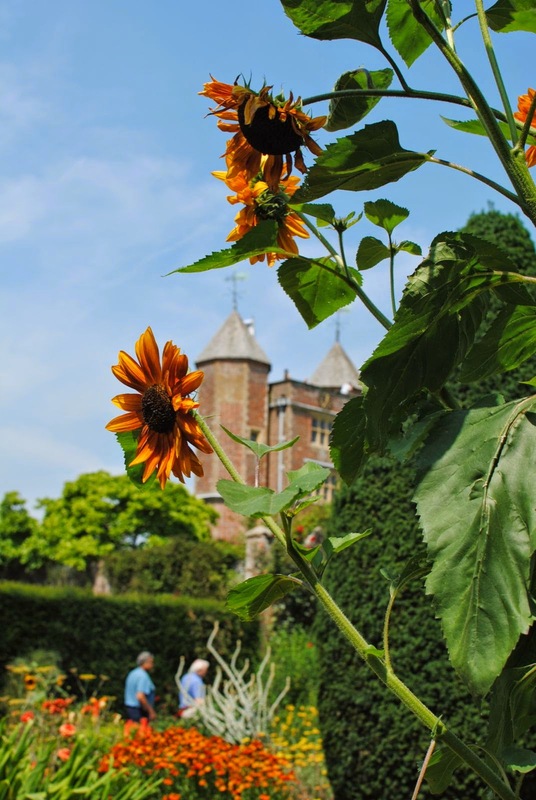 Unlike most NT properties there isn't a house to visit at Sissinghurst Castle. You can climb the tower (above) and that is what we did first to get our bearings. From the top we could see the formal gardens, orchard, oast houses and fields beyond. Having negotiated our way back down the narrow staircase we headed into the formal gardens. There was a board in the tower describing the gardens as having a maximum formality in their structure and maximum informality in their planting. It was a pretty good description. The beds in the walled garden were laid out just as you'd expect from a formal English garden, but the planting was a lot more free form. After doing a first pass of the formal gardens we walked along the moat and through the orchard (where the grass is cut once a year - by hand this time around), we went for a final spin round the formal garden. Just after I took the picture of the sunflower below, another visitor snapped the head off the plant trying to smell it. What a waste of a good sunflower! Leaving the gardens we headed back to the car to pick up another bottle of water and this time I was able to slip the jewellery box into my pocket while Becks changed her shoes. Armed with more water we headed off on a walk around the estate. Escaping the crowds we were pleased to be walking through the shade of tree lined paths during the heat of the day, resting for a while in the bird hide overlooking a pond. Despite the bird feeders being full of nuts we didn't see a single animal while we were sitting there. 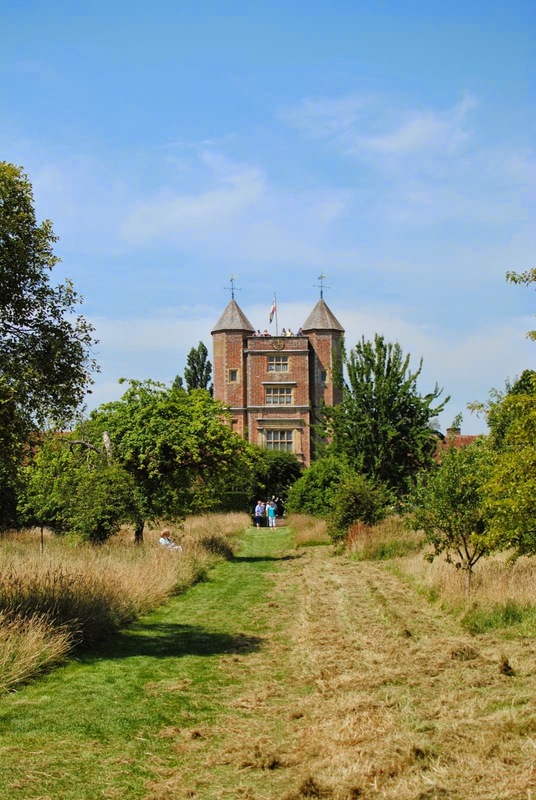 Continuing on, we arrived at the high point of the walk, with views back over Sissinghurst. Being in a secluded spot with great views, I thought about popping the question. However, Becks started saying how hot she was and I could tell the moment wasn't quite right. We arrived back at the house, amused ourselves with a novel stile, and then visited the café for a scone. Fortified from a sit down we headed across to the vegetable garden. I was expecting to garden to be bursting with produce in July and was surprised to see it less full than I expected. I don't have any green fingers, but had thought that at the peak of summer there would be a lot more fruit and vegetables on display. After a quick look round the shop we had a sit down in the shade under the trees. We sat listening to some Kiwi accents behind us and then I dozed off for an afternoon snooze. I don't remember dreaming but I must have been thinking about proposing, as when I woke up I thought "this is the moment". Until I realised that there were some people sitting a short distance away from us and it wasn't quite as private as I thought. Just before we left, we visited the oast houses which had an exhibition about the former owners Vita Sackville-West and her husband Sir Harold Nicolson. The exhibition was full of letter between Vita and Harold. I clearly read them too quickly as I missed all the scandal of their various affairs.